We mentioned the site myNoise previously in a post about focus. It’s a great site that we wanted to talk about Even More because it is immensely helpful, and because the creator, Dr. Stéphane Pigeon, doesn’t just have an amazing name, but several more amazing sites. As a sufferer of tinnitus and hyperacusis, I have looked into a few similar sites. I’ve downloaded the apps, played ambient noise during work, sleep, walking around, etc. Many didn’t help or were especially distracting. My tinnitus is not too severe, but the hyperacusis sure is, and without background sounds I get nothing done. I have spent much of my life playing television nonstop so that there is sound. I have a no pausing policy. If I leave the room it continues playing. If it’s a show I haven’t seen before and I missed something, I’ll rewind. But there can’t not be noise. The creator is a “signal processing engineer with a passion for sound” and uses his vast experience to target some of the noise generators toward helping specific situations. He includes guides on how to use the site, and and each generator has preset slider settings you can click for popular setups. The idea behind myNoise is to use the noises you most enjoy to mask the noises you don’t want to hear: chatty colleagues, your tinnitus, or even your inner voice when you can’t shut it down! The creator of the site has a letter that he wrote about why he asks for donations. This is one of the nicest donation pleas I’ve ever seen, and part of that is because he explains exactly why the money is needed. He details the costs of recording and doing sampling sessions. On his blog he even tells people the cost of some individual trips he’s taking. None of that is necessary, but it’s nice to see what donations are for. Often you’ll see people asking for donations without explaining why (which is one of the reasons that GoFundMe drives are so terrible). It’s pretty intense and feature-filled though! You can move sliders up and down for every noise generator to change which frequencies you hear most. 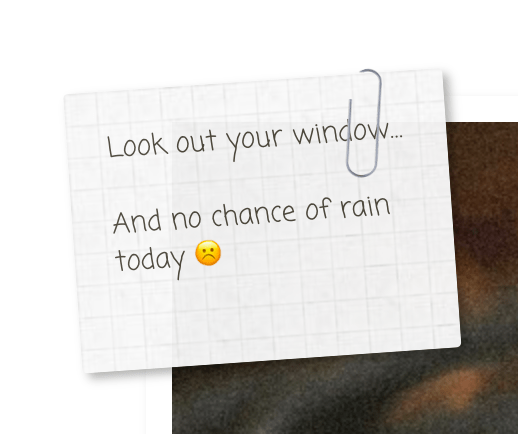 You can adjust chatter in a cafe noise generator, or the sound of wind in a rainy day one. The site offers calibration for some of the generators. I haven’t seen this calibration option anywhere else, and it helps match the noise to your hearing and to compensate for background noises or the quality of your speakers, for example. All of this fine-tuning is great, but sometimes it seems like too much. Lucky for us, this master of sound has given us many places and many ways to fill up our ears. Not only are they all excellent, but also the websites are all super well designed. 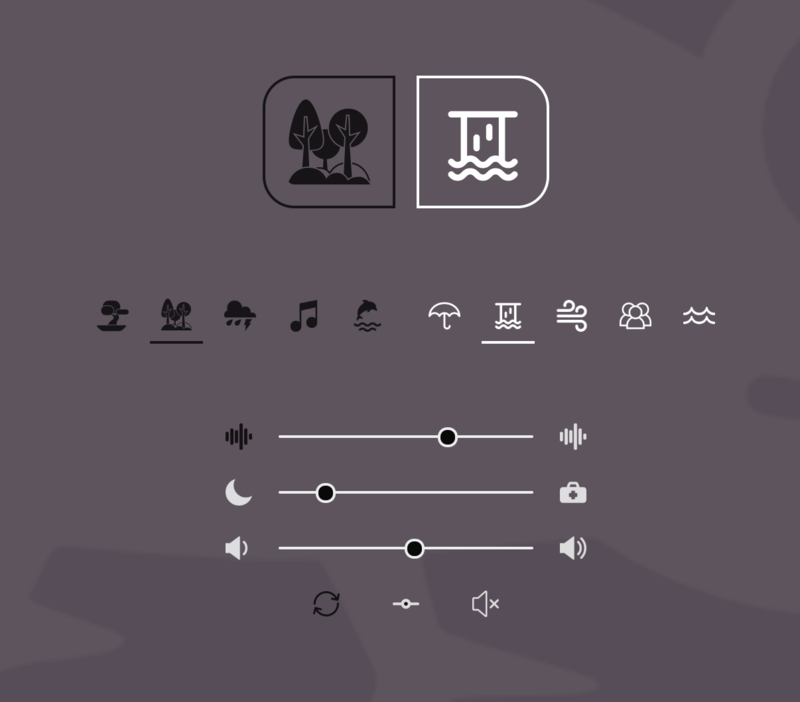 Soothing color scheme and adorable icons aside, this site is great for some simple, quick ambient noise at work or when trying to write your daily Sneers. Just click on any noise, from Autumn Breeze to Cocktail voices, and it’ll start right up. Click on it more to lower the sound. If you’re feeling like a little more fun, go ahead and try two or three noises at once. There’s no configuration for each noise, so it’s nice and simple. Just kidding! If you miss some more control, you can scroll down to access sliders for changing the tones and “liveliness.” You can save noise sets and name them so you can bring them up quickly later, which is very useful, especially if you make a lot of changes. It shows you what sounds and levels are associated with each preset noise with the icons and shades. You can also generate a URL to share your noise set, with the thumbtack icon. A pick of the week listed up top provides for some interesting suggestions. Think, chameleon, but for noise. “Like the colors of a chameleon, the sounds you hear on Calmy Leon slowly change over time.” It’s great! You can change a lever to get more noise for focus, or for relaxation. Because of the dynamic way that it plays different kinds of sound, it’s great to leave on in the background while working or reading. The background color also slowly changes over time, and it’s very soothing! You can make changes to what you’re listening to, but so far this is my favorite one to leave alone and let it do its thing. Big fan of the peekaboo chameleon in the background. The simplest out of all these sites, this one has just one focus. It will provide rain sounds! You can add in thunder, or choose the beautiful noise of After the Rain, my personal favorite. 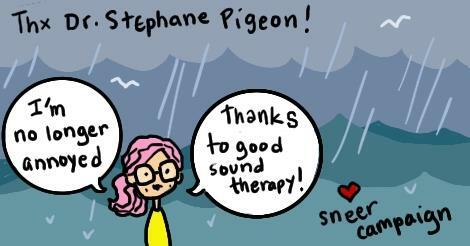 It boasts that rain noise, similarly to white noise, contains all the frequencies that people can hear, but is much more natural sounding. The cutest feature? It tells you on the left side if you’re in for rain in your location that day. Pretty simple looking until you begin factoring in your psychological needs! Meowing cat or sleepy cat? How upset will the real cats get, or will it chill them out for some reason? Will they know it’s practically music to our ears, or will they think there’s a very large and loud invisible cat somewhere? Will you begin to? Listen forever and ever. myNoise has several fans (and patrons!) in Sneer Campaign and we think you’ll appreciate one or all of Dr. Stéphane Pigeon’s sites as much as we do. I ain’t his publicist, so I won’t ask you to donate (even though you should) but I like supporting artists and people trying to save the world. If it’s your jam, you can listen to myNoise albums on Spotify, or subscribe to his YouTube channel. There are also apps for iPhone and Android. If you do audio stuff, he sometimes gets help from some wonderful myNoise friends. Hey, does he need a publicist? I’m just waiting for an ambient sitcom track and my life will be complete. If you need me, I’ll be over here listening to the Impulse Noise Generator.